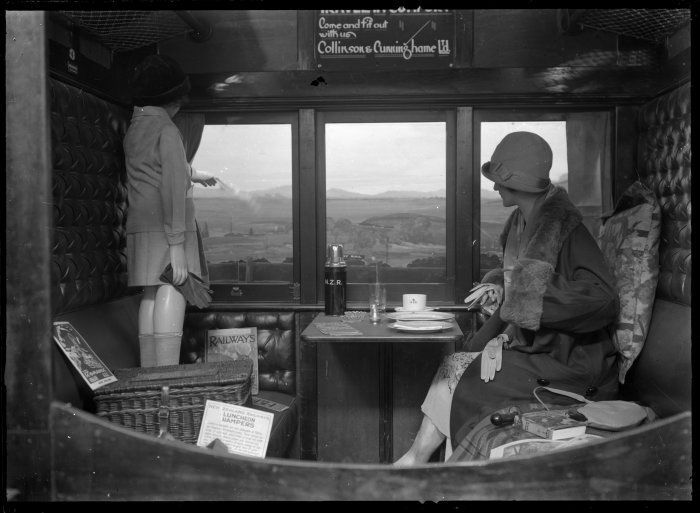 Just came across this picture of a civilised-looking 1920s journey. One of those happy coincidences – that probably isn’t really a coincidence, but more the fact that I’m thinking about trains a lot at the moment and thus the universe is sending trains in my direction… not literally, of course. By 1900… commuting was not such a chore. Trains were luxurious; seated in upholstered easy chairs one was served with tea or alcoholic refreshments by uniformed attendants. The railway companies sought to make long journeys as painless as possible, providing civilised restaurant cars, commodious toilet compartments, perfumery and shoeshine facilities. A person would hardly know they had left home. Sounds way more fun than standing on a platform for an hour waiting for a Southern train to show up and whisk you away to Sutton!